We’ve headed to the beach! Mamallena has finally opened our first beach hostel just 2.5 hours from Cartagena and on the road to Medellin. Rincon del Mar is an undiscovered beach town, a real fishermans village that is well off the tourist trail. That won’t last long though and where the backpackers start to go, other the tourists will follow. We’re located right on the beach, so you literally step from the doors onto the sand and into the water. Its not luxury but you’ll love it. From Rincon del Mar you can also head to the amazing San Bernardo islands. If you’re up for a bit more adventure we can organise horse riding and other activities. Hostel Mamallena, Rincon del Mar is the perfect stop off if you want some relaxing beach time. Either come see us straight from Cartagena or make it a stop off on the bus between Cartagena and Medellin. 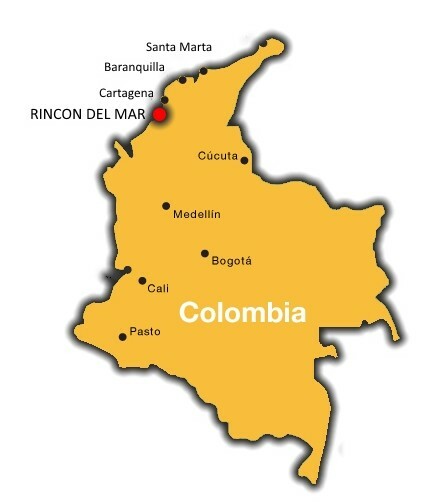 Rincon del Mar is a small fishing village in the department of Sucre, Colombia around 13km from ‘San Ofre’ 2.5 hours south of Cartagena along the Caribbean coast. Conveniently located for day trips to the popular San Bernardo Islands we believe the town is a perfect location for travelers interested in seeing a part of Colombia well off the usual tourist trail. This is a great location to stop at if you are heading from Cartagena to Medellin and absolutely perfect for a few days rest and relaxation before hitting the big cities again.